New York Giants defensive back Tyler Sash makes a catch during NFL football camp in East Rutherford, N.J., Monday, July 29, 2013. Former NFL and Iowa safety Tyler Sash, who died last year at age 27, has been diagnosed with chronic traumatic encephalopathy. Chris Nowinski of the Boston University-affiliated Concussion Legacy Foundation confirmed the diagnosis on Tuesday night. The New York Times was the first to report the finding. CTE, which can be diagnosed only after death, has been found in the brains of dozens of former football players. Linked to repeated brain trauma, it is associated with symptoms such as memory loss, impaired judgment, depression, and, eventually, progressive dementia. Sash, who won a Super Bowl during his rookie season with the New York Giants, was found dead at his home on Sept. 8. The Iowa State Medical Examiner's office found he died from an accidental overdose after mixing two powerful pain medications, and a history of painful injuries was a contributing factor. Months after the Super Bowl victory, Sash was suspended for four games in 2012 for violating the NFL's performance-enhancing substances policy by testing positive for Adderall, a stimulant used primarily to treat attention deficit hyperactivity disorder and the sleep disorder narcolepsy. 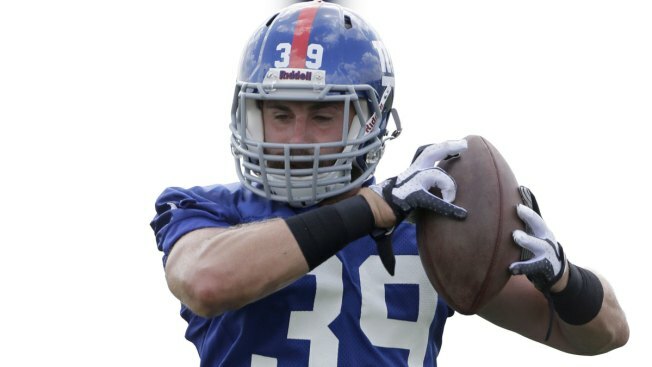 The Giants cut ties with Sash prior to the 2013 opener, reaching an injury settlement after he sustained a concussion in the preseason finale against New England. At Iowa, Sash started 37 games from 2007-10, earning first-team All-Big Ten honors in his final season. He bypassed his fourth year of eligibility to enter the NFL draft.